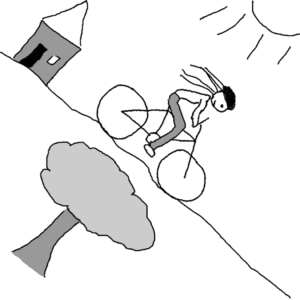 I loved racing my bicycle down the hill. The sun reflected on my forehead and the wind played with the locks peeking down from under the helmet. I felt butterflies in my stomach because the speed was reaching the limit I could comfortably handle. I was in the seventh heaven until it occurred to me that on my way home I would have to pay for this moment of joy by cycling back up the hill.